How can universities communicate the wider value of higher education? Is Facebook a no-go for teachers? A unique, intensive careers event for students and graduates with disabilities/specific learning difficulties. Registration is required and is available on ahead.ie. Registration closes on the 4th November. This event will be followed by the AHEAD Annual General Meeting (AGM). Expert panelists include Dr. Marian McCarthy, Dr Geraldine O’Neill and Declan Treanor, Director of Disability Service, Trinity College Dublin. Please note this event is only open to members. 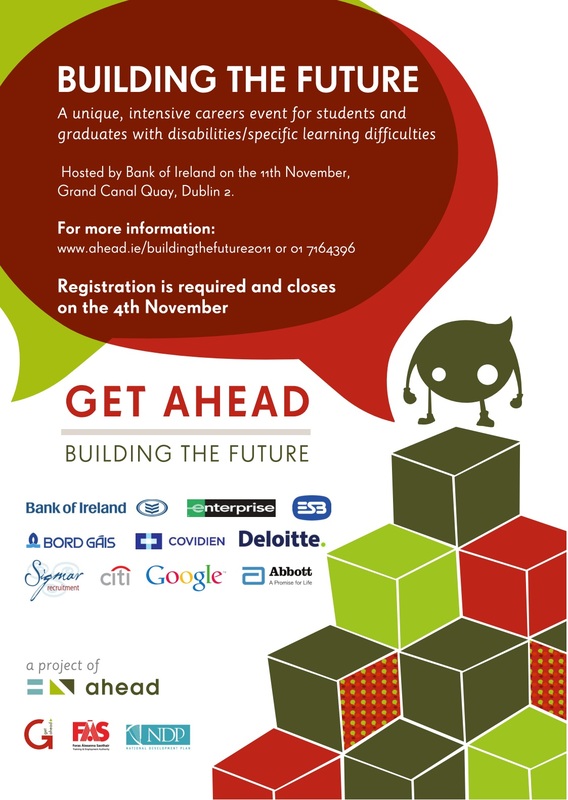 A unique one-day event for students with a disability or specific learning difficulty considering their college options in Ireland in 2012. Better Options is on in the National College of Art & Design, Thomas Street, Dublin 8 from 10.30am until 2pm. This event is FREE and all are welcome, including Students, Guidance Counsellors, Resource Teachers, Learning Support Tutors, SENO’s, NEPS & Parents. Help us to promote these events! Download the flyer here and send to friends and colleagues: AHEAD Upcoming Events November 2011 Flyer or share this blog post with them!!! Artist Kate Hartman uses wearable electronics to explore how we communicate, with ourselves and with the world. In this quirky and thought-proviking talk she shows the “Talk To Yourself Hat”, the “Inflatable Heart”, the “Glacier Embracing Suit”, and other unexpected devices.